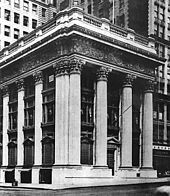 ^ Federal Hall, with its statue of George Washington, is seen on the right. 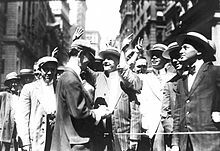 ^ This curb market later became the American Stock Exchange. ^ Situated at the northwest corner of Fifth Avenue and 34th Street. 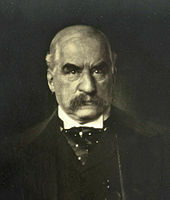 ^ He had rescued the U.S. Treasury during the Panic of 1893. ^ Here trading nearly collapsed at the end of October as banks were reluctant to lend. ^ He is commanding two bears symbolize "Interstate Commerce Commission" and "Federal Courts". From Puck, May 8, 1907. ^ A February 2, 1910 editorial cartoon in Puck titled: "The Central Bank—Why should Uncle Sam establish one, when Uncle Pierpont is already on the job?" ^ AMERICAN BANKS "IN THE JUNGLE".. The Advertiser (Adelaide, SA : 1931 - 1954) (Adelaide, SA: National Library of Australia). 16 March 1933: 8 [22 November 2012]. ^ Paul Saffo, ABC News (April 17, 2008) 互联网档案馆的存檔，存档日期September 27, 2011[日期不符]，. ^ WHEN THE POUND SAVED THE DOLLAR.. Western Argus (Kalgoorlie, WA : 1916 - 1938) (Kalgoorlie, WA: National Library of Australia). 8 December 1931: 36 [22 November 2012]. ^ US Business Cycle Expansions and Contractions, National Bureau of Economic Research. Retrieved on September 22, 2008. ^ Jean Strouse. "Here's How It's Done, Hank: A Parable From a Crisis of a Century Ago". The Washington Post (September 28, 2008), p. b1. Retrieved on September 30, 2008. Johnson, Owen, The Sixty-first Second (PDF), New York: Frederick A. Stokes Company, 1913, OCLC 3101622 . Retrieved January 11, 2010. Tallman, Ellis W.; Moen, Jon, Lessons from the Panic of 1907 (PDF), Federal Reserve Bank of Atlanta Economic Review, 1990, 75: 2–13 [2009-03-03], （原始内容 (PDF)存档于2008-10-29） . Retrieved on September 14, 2008. 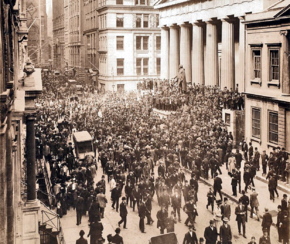 A Central Bank as a Menace to Liberty, by George H. Earle, Jr.